For the last few weeks I’ve had a recurring dream: I’m in bed and hear loud voices in my living room. I rush out to a crowd of unfamiliar men and women dressed in semi-formal wear, laughing and drinking cocktails. And, they are stealing things. They are yanking books and photos and souvenirs off the shelves and stuffing them into their bags. One guy rips a photo out of an album and sticks it in his wallet. He shows his friend and his friend laughs his head off. 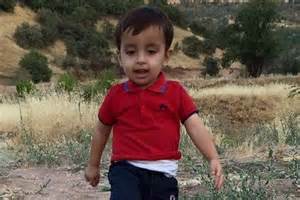 Then, in the center of the room: Aylan Kurdi’s three year old body. Face down. His red T-shirt. His blue shorts. I scream, but I can’t. make. sounds. Only gaspy breathy noises. My arms flail. I run to the child. Take his pulse. No beats. Run to the phone. Still. Can’t. Make. Sounds. Only horror breathing. I grab a woman pilfering through my cupboards. Point at the little boy in the red T-shirt. She doesn’t see me or feel me, only shoves a coffee pot into her bag along with my favorite mug. I grab a man plucking yellow tulips from a vase. He doesn’t feel or see me either. No one sees me, see them, not seeing the little dead boy. To say I’ve been thinking about this dream would be an understatement. It has shaken the hell out of me. Its message of lost/stolen identities blatant. The child’s image making it hard to function at work. I’ve become irritating to others as I try to control minutia because I can’t control the big important things. People say: AVOID LOOKING AT THAT PICTURE. Their reasons are many and some are understandable—I grasp emotional sensitivities to the core. Yet. I can’t not look because I’ve been a child on the floor in a room full of cocktail drinkers, laughing their heads off while I sit there in bright colors that hide unspeakables. I can’t not look because I am grateful beyond stars for people who reached in and pulled me to safety. I can’t not look because it’s a little boy left. I can’t not look because it’s the only way I know to help bring his voice back. I’m angry we didn’t get there in time for this little boy. I’m angry this happened in 2015. And…and…I’m determined to stay hopeful, because consciousness is changing…more people are looking and asking questions and getting angry. And when that happens? When we unleash collective anger? Raise our collective voices? A tremendous creative power is released and life begins to change. We find new ways to battle cruelty and injustice. Right now, there are people working 24-7 to support insufficient refugee services strained to breaking, while hundreds of thousands more humans are on their way, hoping for a better life, hoping someone will pull them in before they drown. 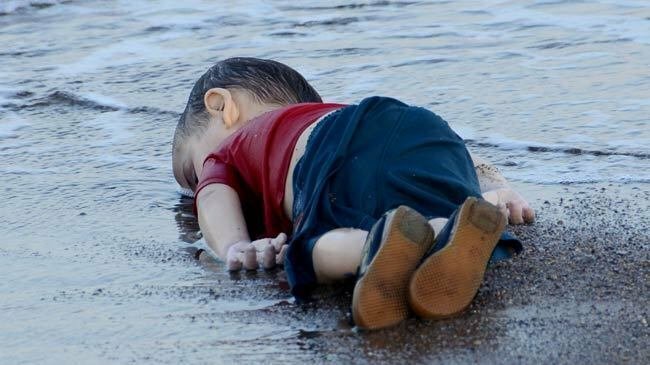 So even if we disagree with the insanely complicated politics about the right or wrong of all of this, or whether Aylan’s father should or should not have taken his family on that boat—ultimately, it’s about humanity and those who will die today seeking a better life. We have the resources. We are not small, powerless children. We are adults with huge hearts and incredible strength. We can look. We can ask questions. We can respond from the gut. Maybe it will seem futile. Maybe it will seem like we failed? But we won’t have failed because there is monumental meaning in taking action. In the effort, we strengthen our voices and with stronger voices comes truth and freedom. Mercy Corps: Refugees are most in need of clean water, sanitation services, temporary shelter and food. Migrant Offshore Aid Station: This charity runs independent rescue boats to rescue migrants at risk of drowning. Unicef: The UN’s children’s charity is providing life-saving supplies such as clean water, medicine and psychological support. $10 could provide an emergency water kit for a family. The US refugee charity the International Rescue Committee has opportunities to volunteer at all of its 22 offices. Roles include mentoring refugee families and helping refugees find jobs. Can hardly see to type through my tears. Thank you for the fury and the hope, for the call to action, for bringing the face of life and of death into these small moments of our day. Thank you Anna. Your voice, genuine, your heart, felt. thank you for taking the time to read this and for your heart comment. Powerful message, Anna. Thanks for including the info on how and where to help. Words that make us see, that clear the mist from eyes that don’t want to see, are the most powerful of all. Thanks for speaking out with such eloquence and pragmatism. You are currently reading Aylan at anna quinn.